"Cash Only". That is pretty much a given with hole-in-the-wall restaurants. Hey, everyone needs to earn a living right? With a smaller operation, there is an inherent need to cut as many costs as possible, namely credit cards. However, dare I say under-the-table activity as well? I won't speculate; but c'mon... who are we kidding? I'm not judging at all. Once again, everyone needs to make a living and pay the bills. That's the bottom line. However, for us consumers, it is a real drag when all you have in your wallet are receipts and lint. Even worse when the nearest bank machine is not within walking distance and a $2.00 service charge is in order. 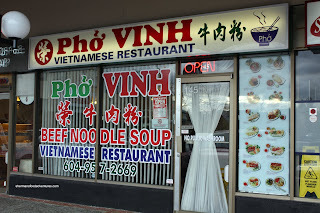 That was the case last time Pomegranate and I wanted to grab some eats at Pho Vinh. No cash, no Pho. We tried Bubble World for some TBN. Once again, no cash, no TBN. We settled on Maguro since it accepts credit cards. This time around, it was Viv and I attempting to eat at Pho Vinh. Once again, no cash. But they accept debit! Good thing too, we were in a Pho mood. Before I discuss what we ate, I found it interesting that they included Saw Leaf Herb along with the usual basil, sprouts, peppers and lime. It's very similar to cilantro, probably even a bit more pungent. There are not many Vietnamese places in town that serve this herb. 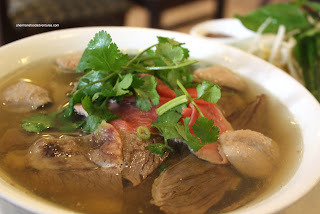 In a role reversal, Viv ended up with the Pho Dac Biet (with almost every meat). Apparently, it included a Spring Roll. I guess we didn't read the menu correctly. We were dismayed that they used a wheat wrapper rather than rice. 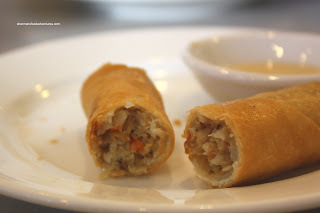 Despite this, the spring roll was decent with a good amount of filling that had a nice onion/fish sauce taste to it. As for her Pho, there seemed to be a serious lack of noodles. After a few bites, she was only left with meat. It's good that they provided enough meat; but cu riously not enough noodles (which are not very expensive). The meat was good, generally tender and pretty typical. We felt the broth was too much on the sweet side and a bit too light. Not a bad broth, we just wished there was more meat flavour to it. 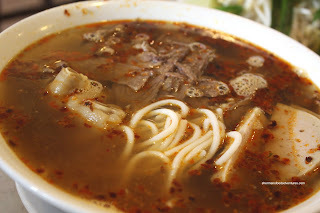 For some reason or another, I went for the Bun Bo Hue again for the second time in 2 weeks. I just had the one from Pho Tam and it was so good, I was craving for more. Unfortunately, the one here paled in terms of portion size. Once again, there was a serious lack of noodles. Noodles are inexpensive, put more in! At the very least, the noodles wer e good. Nice rebound texture, albeit slippery suckers as per usual. I felt the broth was quite good with plenty of spice and some tang. Much like Viv's bowl of Pho, the meats were good and I liked the addition of a pork knuckle. 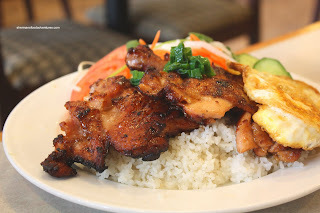 Now, for some reason or another (probably I wanted to try it), I ordered a Lemongrass Chicken on Rice with egg as well. Turns out that it was a great decision since my bowl of noodles was not enough for me. I think the one at Pho Tam is easily double the size. I thought the rice dish was fantastic. It was a lot of food. I didn't finish it. The chicken was tender with a good amount of charring. Great lemongrass flavour as well. A good end to a relatively okay meal. I would say the food here is middle of the road Vietnamese. 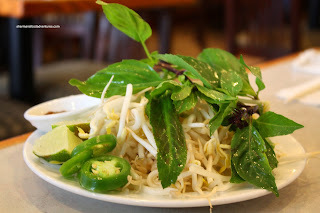 Maybe I'm stuck on my love for Pho Tam; hence, I'm always comparing places to their standard of quality and portion size. It could be unfair to do so all the time. 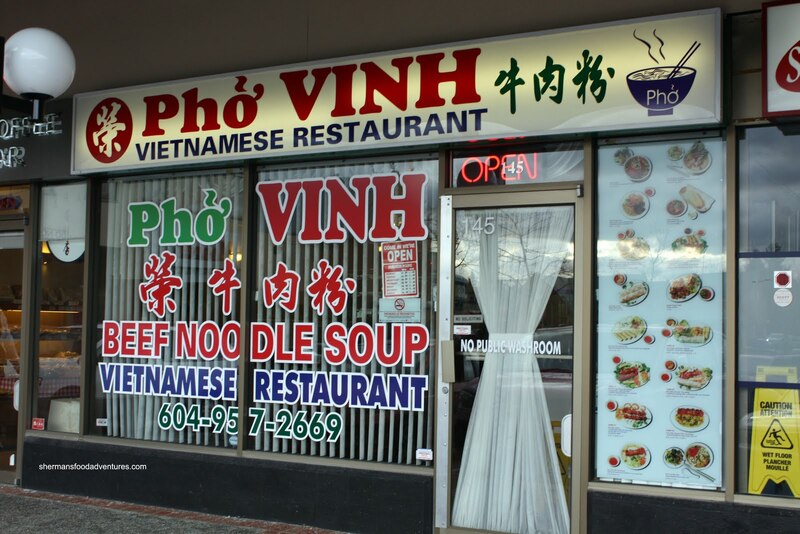 However, I do think that Pho Vinh should put more noodles in their Pho considering their slightly higher than average prices. But if you're not a big eater, the place does the job. - Accepts debit, that one step above "Cash Only"
Yeah, I haven't seen saw-leaf in that many places either. There was one place in Kingsway which added it but, well, they closed. Hope that is not a sign of things! Yah, can u believe that? Noodles are relatively inexpensive. Just put more in already!